*You can use granulated sugar in place of the raw. However, the raw sugar imparts a nutty, more mature flavor. My survey when I started making toffee showed a preference of 4-1 for the raw sugar variety. Place ingredients into a stainless steel Qt pan. The sugar and butter mixture will rise and bubble, so it needs room. Save the butter paper and use it to lightly grease a small aluminum sheet pan. Set aside, but not too far away, as you’ll be pouring the very hot sugar and butter slurry into this pan. Using a candy thermometer, while stirring continuously, bring the mixture to 308 F. This will take 45 minutes to an hour. When making candy, I suggest using a long rubber spatula and not metal. At 308 F, immediately remove from heat and pour into a sheet pan. Let the finished toffee cool completely. When the toffee has cooled completely, I suggest using a clean cotton towel to remove the excess fat/grease from both sides of the toffee, this will help when enrobing with chocolate. When cooled and cleaned, break up the toffee into the perfect size pieces. You probably wont be ready for chocolate at this stage, unless you planned really well, so make sure the toffee goes into an airtight container. Sugar loves moister, and this will make it chewy and sticky. Both are things that are bad, in my opinion, when it comes to toffee. Hand-dip each piece into your favorite tempered chocolate and place on parchment paper to harden. A quick and easy version suitable for a family gathering and to be eaten that day, make the toffee like above. In the lightly butter the pan, dump your favorite chocolate chips and spread them out. Dump the hot toffee over the chips. Let it cool. Break and enjoy. Even if you put it in an airtight container, it’ll start getting sticky/chewy pretty quickly. It’ll only last a day or two. It won’t look amazing, but it’ll taste amazing. Note: If you decide you want to make larger batches, scale the water accordingly as well. While this is a recipe, making hard candy is a bit of a science. 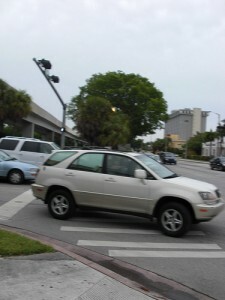 There are any number of issues that can occur and may require additional research. 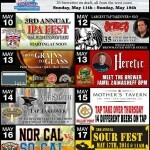 I’ve had a number of people ask me about American Craft Beer Week in SLO that took place May 10th – 18th. First off, let me say, I looked forward to this week for the last year. I had such a great time last year, I had planned to hit every event. I always enjoy heading out on a pub run. I mean, what’s not to enjoy. Going for a run, which I’m going to do anyway, with a free beer at the end. Throw in a pair of shoes to try out, and I’m always down. 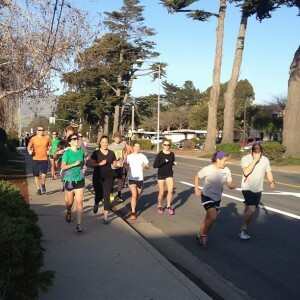 Last night’s pub run with Running Warehouse was hosted by Michael Marquez and the Creeky Tiki (Huge thanks!) with Nike bringing the shoes. The run was a pretty flat, 4 mile out and back starting from the Creeky Tiki, then heading over to the train station and finally heading along the train trail loop and back. As a triathlete, I find that I train pretty much alone. Maybe, one out of every 15-20 training sessions do I have anyone training along with me. The fun part of any pub run (besides free beer) is the opportunity to run with and get to know a fellow runner. Running with someone can always have an impact on your pace. Sometimes positive and sometimes negative. This time it was very positive. After a really slow run on Monday, my running partner helped me push myself a bit and I felt really good about my pace and how I felt overall. About the shoes. Let me first say I’ve only worn them for 4 miles. My review should not be considered an exhaustive review of the shoe. You can read more about the shoe from many other sources online. For reference, my current stable of shoes consist of the Merrell Bare Access 2 (0 drop, 4mm stack) and Saucony Kinvara 3 (4mm drop, 23mm stack-heel). The Terra Kiger is closer to the Kinvara, matching the 4mm drop and a 22mm stack at the heel. The Terra Kiger is made for the trail, and looking at the sole, I’m confident it can hold its own. My run was all paved, and very flat, so again, my review is limited. My feet are naturally a 12.5, an odd size that only the big manufactures tend to carry, but Jarrett from Nike had a pair for me. Fit was spot on, if a little tight along the top for my high volume foot. As is typical with Nike shoes and my feet, there seemed to be some give in the back of the shoe (see picture below) that makes it hard to feel truly comfortable. 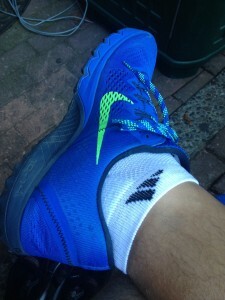 However, unlike the Free Run 3’s I wore for about 90 miles, it was forgotten quickly and the shoe was very comfortable. I really liked the feedback and responsiveness of the shoe. For a trail shoe, it also felt light on my feet weighing only 8.3oz (for a size 9). The only challenge I had with the shoes, was I developed 2 hot spots on my right foot around mile 3. One spot at the tip of my longer second toe and one mid-ball of my foot. My left foot didn’t develop these hot spots. Take that with a grain of salt, as it was only one run, in demo shoes. 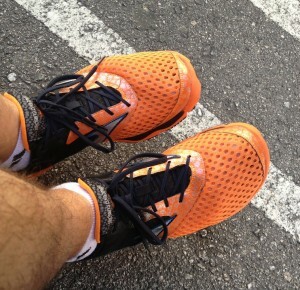 Also, since these were only worn for a short run, I can’t speak to how the upper will feel after mile 15, or 30. Response online seems to be that the upper is very comfortable even during ultra-distance events. If you’re looking for this shoe, head on over to Running Warehouse and pick up a pair for $125. For those of you in SLO, the next Pub Run is September 10th starting from the Creeky Tiki again. Hope you can make it. Well, yes, but it’s simpler than that. I’m hurt. Not emotionally, just physically. Last week I strained my left calf muscle. The strain was one thing, but the muscle deciding to knot up 3 hours later, multiple times, was enough to get me to do something drastic… Call a doctor. Hence the frustration. There’s nothing that can be done. Normal recovery pattern; RICE treatment, don’t re-injure, plan on no running for 4 weeks, blah blah blah. GAH. I’m a triathlete. I can’t just sit around and do nothing. My body is used to pushing itself 5-6 days/week. There are goals this year. I’m missing races. But mostly, I’m just frustrated sitting and limping. The good news is I plan on getting into the pool tomorrow to see how swimming goes. As long as I keep myself from pushing off the wall with my left leg, I should be OK. However, the pool is where I tend to encounter muscle cramping issues, so I’m a little nervous. Not just about my time in the pool, but the hours after. I can also bike. Sorta. A stationary bike without clips, so I can push with the heel and not flex my left foot. All these limits. 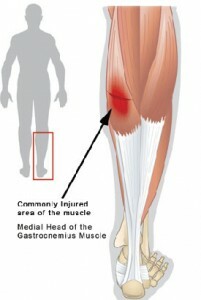 When you’re injured, how do you handle it? For those of you that have lost significant weight, how do you deal with an injury and not put weight back on? 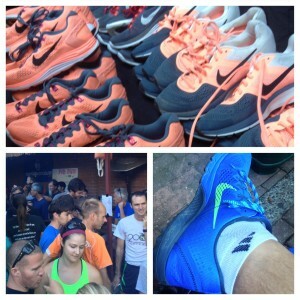 Had an opportunity last night to try out a pair of Mizuno Wave Evo Cursoris at the Running Warehouse Pub Run. First and foremost, the run was amazing fun. It was the largest group I’ve seen out and was well-timed with my upcoming Half-Marathon coming up Sunday. We met at Laguna Grill and had a nice 3.5 mile trail run on the Irish Hills Trail. More on that in a minute. 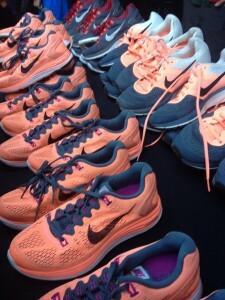 After showing up, I had an opportunity to speak with the Mizuno rep and talked briefly about my running style. He recommended I try out one of their newest shoes, the Wave Evo Cursoris. They actually had them in my size! a 12.5. That’s a first for me. They were extremely bright in an almost florescent orange, but fit was great. A quick run around the parking lot confirmed they were the right size and would be fine for my run. No need to get blisters right now! Heading out, the 50+ people broke into about two groups. I had never run the Irish Hills trail, so I didn’t know exactly what to expect. I found out quickly, that the trail is pretty much up, then down. Not really much in the way of flat land. You’re going up or down, the entire time. The trail, while well-groomed, is also really rocky. I typically wear Merrell Bare Access 2‘s, which only have about 4mm of cushion. The Cursoris have 12mm of cushion stack, and wow, I was happy they did. The marble sized pebbles weren’t an issue in the Cursoris. I could feel them at spots, but nothing to hurt my foot. While the shoe isn’t a trail shoe, it was well-balanced and handled the trail just fine. Light at 6.8oz, I was impressed at the amount of punishment it took. The mesh upper allowed my foot to move around naturally, but I would recommend that you go a half-size smaller than you would in a traditional shoe. I noticed it when my toes were against the front of the shoe on the steep down hill of the trail as I slowed my descent. Unlike my Merrell’s, the shoe allows for a high-volume foot, so if you’re like me, you’ll be really happy with the fit over the top of the foot. The only negatives I have with the shoe are the color choices, bright green and orange. I wear my running shoes for work and play after I retire them from running, and the bright green and orange just don’t work for everyday wearing. Would I buy them? I did offer to wear them this Sunday in the SLO Half-Marathon, unfortunately they took them back with them. I will definitely consider adding them to my shoe stable to wear along with my Merrell’s and handle those times when I’d like more cushion. You can pick up a pair at your favorite running store, or grab them now from Running Warehouse!